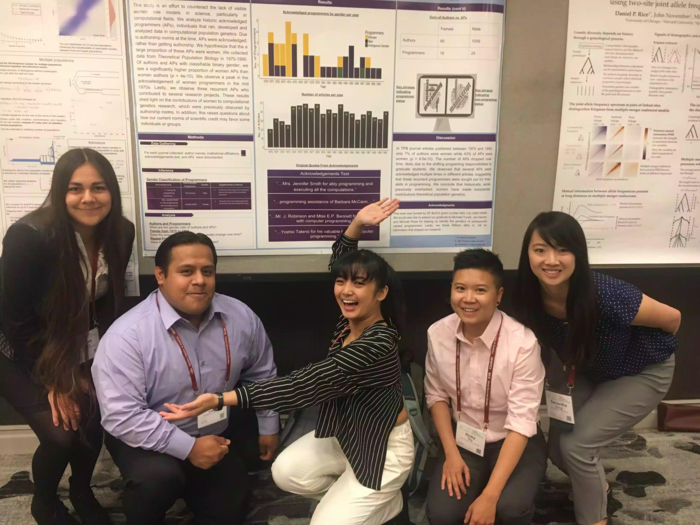 Ezequiel Lopez Barragan, Rochelle-Jan Reyes, Samantha Kristin Dung, Andrea López, and Ricky Thu present their work at 2018's Population, Evolutionary and Quantitative Genetics Conference. Photo credit: Mayra Banuelos. An analysis of the acknowledgment sections of theoretical population genetics papers from the 1970s and 1980s reveals overlooked contributions of women to the foundation of the field. Theoretical population genetics has a gender imbalance, and it’s easy to get the impression that it’s always been this way. After all, introductory genetics courses emphasize important concepts such as the Hardy–Weinberg principle, the Wright–Fisher model, and Haldane’s rule, all named after the men who made these critical advances in the field’s early days. But according to a Perspectives article published in GENETICS by a team of undergraduate researchers from San Francisco State University, women contributed more to population genetics during a transformative era in its history than would first appear. Today, much research in theoretical population genetics depends on computer simulations rather than the pen-and-paper work of the field’s founders. Programmers thus became important contributors to the field as soon as computers capable of such tasks were developed, although authorship norms at the time meant their names were typically relegated to the acknowledgements. While the gender breakdown in programming now favors men—although this disparity has shrunk somewhat in recent years—the ratio of male to female programmers hasn’t always been so lopsided. The inspiration from the project struck during a discussion between Rori Rohlfs of San Francisco State University and Emilia Huerta-Sánchez of the University of California Merced over coffee. They had noticed how often programmers in older papers were listed in the acknowledgements and thought they saw a trend: a disproportionate number of those programmers were women. “We thought, we should actually figure out how often this happened,” Rohlfs says. So the two decided to find out whether their impression would be backed by a more rigorous analysis. Unconventionally, the study was conducted entirely by a team of seven undergraduate students working under Huerta-Sánchez’ and Rohlfs’ supervision. With little to no prior research experience, the students dove in, searching for programmers’ contributions by manually trawling the acknowledgements of every paper from 1970 through 1990 in Theoretical Population Genetics, a journal selected because of its large proportion of highly cited foundational population genetics papers involving programming. Cutting their search off at 1990 made sense because few programmers were listed in the acknowledgements after that point; instead, they were authors. The team found that although only 7.4% of authors were women within those two decades, women accounted for 43.2% of the acknowledged programmers—and the number of women acknowledged for programming decreased over time, from a peak of 58.6% in the 1970s. In some cases, the gender assignment was simple because participants were given gendered honorifics such as Mr. or Mrs., while in others the researchers had to rely on authors’ names to infer gender, leaving some cases ambiguous. (They note that a limitation of this work is that it would not be possible to separate the contributions of individuals who do not identify as either male or female.) When contributors were acknowledged using initials, the researchers dug for other works in which they were acknowledged, including papers and books, to find their full names. Using this method, the group also discovered that some programmers were acknowledged more than once, sometimes in very high-impact papers. For example, Margaret Wu—who went on to become a faculty member at the University of Melbourne—was not an author but was repeatedly acknowledged, including on a paper with over 3400 citations and counting. Cases like this, the finding that a disproportionately large percentage of acknowledged programmers were women, and the group’s additional finding that papers with acknowledged programmers were cited more on average than those without them were suggest that women contributed more to this critical transition in an apparently male-dominated field than it may seem. The five undergraduate researchers who made the major contributions to the study presented their work at the Population, Evolutionary, and Quantitative Genetics Conference last year, aided by GSA Undergraduate Travel Awards. They say the reception was positive—many attendees were interested to learn about women’s hidden contributions to the field, and some gave their thoughts on further work they could do. “It was great to have a community that was very positive and gave us good feedback about our research and our work,” says study author Rochelle-Jan Reyes, for whom the conference was a first. Presenting on their own as a team of undergraduates was a bit nerve-wracking at the beginning, says author Ricky Thu, and the amount of attention they received at the conference was a surprise to him. “Once I started talking to people at the poster presentation, they were really excited about it,” Thu says. “So I was excited to talk about it as well, and then I got more comfortable.” For their outstanding work, the presenters received special recognition in the conference poster awards. Future studies by this group or others could involve investigating whether these findings apply to different fields or to people in other roles often mentioned in the acknowledgements section, such as lab technicians. The results could also be more powerful if the data collection process were made less laborious. Some conference attendees asked why the group didn’t collect more data by automating the process, but in this case, PDFs of the historical papers were not available on the journal’s website, so the team had to do things the old-fashioned way by going to the library and flipping through each issue by hand. Although their choice of journal makes sense given the high concentration of papers with acknowledged programmers, many journals do make scanned copies of older papers available online. That means it’s possible data collection could be automated using PDF mining and natural language processing—so programmers may be among the authors of these future studies. Check out this fantastic video abstract produced by the researchers, including a link to an interview with acknowledged programmer Margaret Wu.